On March 26, 2017, rather than a lecture this year, we celebrated the work of the nearly 1,000 grantees with a concert at Richardson Auditorium, in partnership with Princeton University’s Center for Jewish Life. 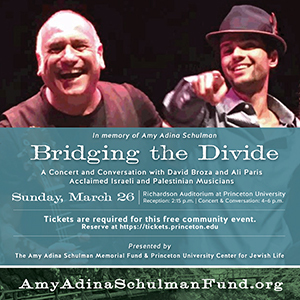 The concert, titled Bridging the Divide, a Concert and Conversation, featured one of Amy Adina’s favorite Israeli folk singers, peace activist DAVID BROZA, along with brilliant Palestinian prodigy ALI PARIS. David and Ali electrified a full house with their mastery of the guitar and the qanun (a Middle Eastern cousin of the zither). Amy Adina first introduced our family to the music of long-time peace activist and musical legend David Broza when she returned from her year on Kibbutz Gesher HaZiv in 1985. When Mel returned from a trip to Israel with the New Israel Fund in the late 1980’s he had a difficult time readjusting to American culture and spent weeks playing his tapes over and over again. A few years after Amy’s untimely death, a David Broza concert at Rutgers University was dedicated to her memory. Since that time, David Broza has remained an artist with a message of peace regarding the Israeli-Palestinian conflict and the myriad challenges that face us all. Broza was highlighted in the March 2014 NY Times Saturday Profile as an individual who is shaping the world as he seeks to bridge the Arab-Jewish divide with music. Ali Paris is a young, rising Palestinian musician who sings and plays the Arabic lap harp called a qanum. “I was really influenced by war to create music,” he says of growing up in Palestine, “and by music to fight against war.” Their music fuses Middle Eastern and Western influences. During the post-concert talkback, 700 audience members glimpsed what is possible when we are able to engage creatively with others and recognize our common humanity. Listening to these artists play music across cultural, political, and generational divides was a transformational experience—an affirmation of the Fund’s core philosophy of investing in grantees who imagine and actively work to construct a future of equality and justice. Amy Adina would have loved the music and the message. ...watch David Broza’s film “East Jerusalem, West Jerusalem,” a hopeful message of equality and unity. (Available on Netflix, Amazon Video and iTunes) Watch the trailer here. Co-Sponsored by Princeton University Center for Jewish Life, Concert & Conversation will take place at Richardson Auditorium in Alexander Hall at Princeton University. The Schulman family was delighted to co-sponsor this event with Princeton University Center for Jewish Life. As in years past, this event was free and open to the public.